Features A powerful little helper. 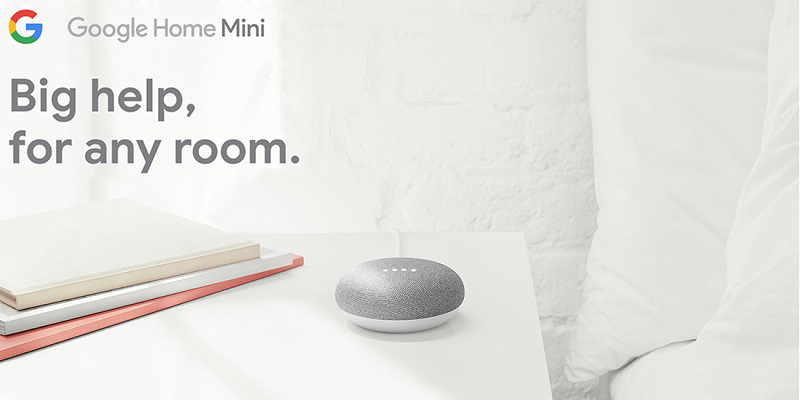 Get hands-free help in any room with Google Home Mini. It s powered by the Google Assistant. You can ask it questions. Tell it to do things. It s your own personal Google. Get answers from Google. Use your voice to quickly find information about the weather, news, sports and more. Hey Google, will I need an umbrella today? Manage your day from breakfast to bed. Get help around the house with things such as your schedule, commute, travel information and even daily routines such as getting ready in the morning. Google Home Mini can even help you find your lost Android phone. "Hey Google, find my phone." Control your smart home with just a few words. Use your voice to control compatible smart home devices such as light bulbs and smart switches. Hey Google, turn off the bedroom lights. Tunes and TV, hands-free. Control your music, films and shows just by using your voice.2 Pair with a Chromecast, so you can start streaming to your TV or speakers from the comfort of the sofa. "Hey Google, play Bollywood songs on Google Play Music." Your voice. Your info. With Voice Match, Google Home Mini can distinguish your voice from others, so everyone can hear their own schedule, commute times, playlists and more.3 Hey Google, when is my first meeting tomorrow? Fun for the whole family. Learn something new, play fun games and listen to stories with the Google Assistant. Want to tell the children that breakfast is ready? Broadcast a message to other Google Home devices around the house.4 Hey Google, let s play a game. Google Home Mini comes in three unique colours: Chalk, Charcoal and Coral. Select the right colour that matches your room and personal style. 1 Compatible devices required. 2 Chromecast device required. Subscriptions to the service providers may be required to access some content. 3 Google Home Mini can distinguish up to 6 voices in total. 4 Your child can sign in to Google Home devices with their Google account managed with Family Link.